This course is recommended for health care professionals, especially psychologists, counselors, social workers, and nurses who provide services to or seek knowledge about the assessment of children covering a broad spectrum of criteria and interventions. Whether unfamiliar or familiar with some of the concepts involved in this material, you can benefit from information in this course. 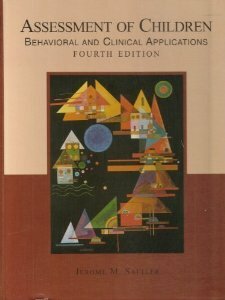 The fourth edition of Assessment of Children: Behavioral and Clinical Applications is designed not only as a teaching text but also as a reference book for students and professionals. The revision is a major one. Every chapter has been rewritten to make the text more comprehensive, relevant, readable, up to date, and informative. The book contains new chapters on objective personality tests and functional behavioral assessment and new material on self-monitoring and school violence. Topics receiving expanded coverage include interviewing and behavioral observations, adaptive behavior, dynamic assessment, and assessment of children with attention-deficit/hyperactivity disorder, children with learning disabilities, children with mental retardation, children who are gifted, children with visual impairments, children with hearing impairments, children with an autistic disorder, and children with brain injury. It also contains many useful assessment aids, learning aids and intervention guidelines.